South Africa did pay $10m (£6.5m) to a football body led by Jack Warner, a figure at the centre of Fifa corruption allegations, local media say. Danny Jordaan, head of South Africa's FA, is quoted as confirming that the amount was deducted from a Fifa payment to the country in 2008. A subsequent letter requested that money to be sent, instead, to the Caribbean Football Union, reports say. South African officials deny it was a bribe to secure the 2010 World Cup. But US prosecutors insist South Africa made an illegal payment after the government promised $10m to Mr Warner - then a Fifa vice-president - in exchange for the "Rainbow Nation" becoming the first African country to host the World Cup. 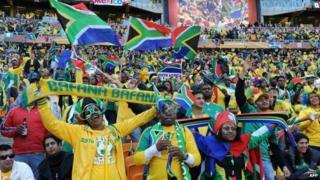 Fifa chose South Africa as host ahead of Morocco. Danny Jordaan could not be reached for comment on Sunday, but he is quoted as insisting the money was paid to the Confederation of North, Central American and Caribbean Association Football (Concacaf) in 2008 as South Africa's contribution towards their football development fund. The BBC's Andrew Harding in Johannesburg says unnamed officials have confirmed that the payment was made to support football development among members of the African diaspora - something which does make sense in the political context of the time. The latest reports come with Fifa - the governing body of world football - in crisis. Senior Fifa officials face a string of bribery charges. Its head, Sepp Blatter has not been implicated but has faced calls to stand down. He was re-elected as Fifa president on Friday. Sepp Blatter's daughter Corinne has told the BBC that there was a conspiracy against her father who is not corrupt and has "earned every penny"
English Football Association chairman Greg Dyke has called on the president of Uefa to show strong leadership to unite Europe behind a collective boycott of the 2018 World Cup.